A lot of people who enjoy my cakes, think that my husband must be very lucky to be married to me and have so many lovely cakes to eat. But, do you know what? He doesn't really like cake that much. With his Birthday approaching, I faced a little dilemma. that doesn't really like cake that much? After much thought and mind changing I eventually decided on this berry bunt cake. I wanted to make a cake that looked so unctuously appetising that even a normally non-cake eater wouldn't be able to resist a piece. This is the first can that I have ever baked in a bundt tin, I am so so pleased with the way it turned out. I used the Heritage bundt tin from Nordic Ware. Such a beautiful tin. When I started researching how to make one, I thought there were going to require a complex recipe with whisked egg whites or such like. To my great delight, it turns out they just require an ordinary pound cake, or equal measures type recipe. I added a few summer berries to my plain cake mix raspberries, blackberries and blueberries, baked it in my tin and look what popped out. I stood back in disbelief for a while, then called in my four year old son. I asked him whether he thought Daddy would like it? "Daddy will like it so much he's gonna fall over"
Pretty, but not quite what I wanted, I made a little glace icing by mixing together some icing / confectioners sugar with a little hot water and then drizzled this over the cake, where it trickled in lovely rivulets between the swirls. 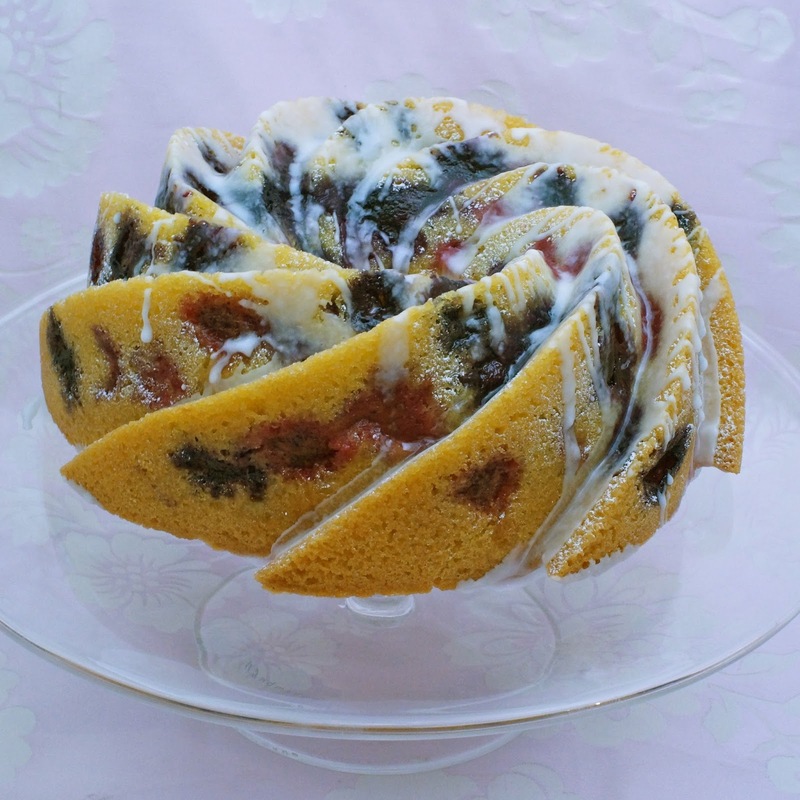 Hubby's Birthday tea is tonight, so we'll find out soon, whether he is tempted by the Berry bunt cake or not. As mentioned above I discovered in my research that you use an "equal measures" mix for a bunt cake. It seems that four eggs is about right for a 10" pan like this one and five eggs for a 12" pan. Prepare your tin by coating with melted butter and the swishing round a little flour or use a non stick spray. and stirred them into the cake mix. Pour the cake mix into the tin and give it a couple of good taps on the work surface to remove any bubbles and make sure the mixture travels all the way into the pointy swirls. For my first time making a cake in a bunt tin, I am so pleased at how this turned out and can't wait to make another one!